By M.D.S Ltd. London. Stores reference 13/44. 1942 dated. 'Capt. 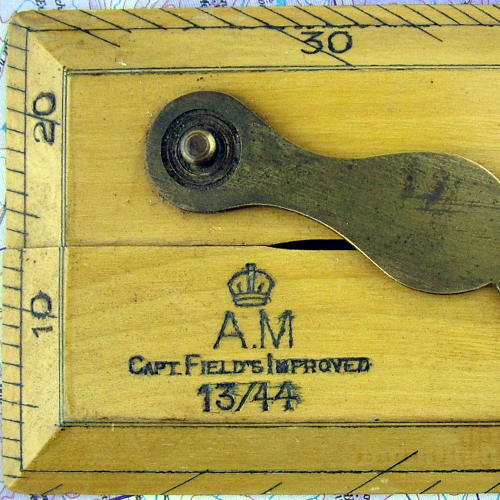 Field's Improved' boxwood parallel rule with brass fittings. Less common smaller version measuring approximately 30cm/12" in length x 6.7cm/2.75" wide when closed. Clear Air Ministry and crown markings. Some minor 'bumps' around the edges. Variable patination of the varnish and tarnishing/verdigris on the right 'hinge'. This could probably be cleaned off with care. Good used condition overall. As used by the Navigator for route plotting in bomber aircraft. Stock code M22086.